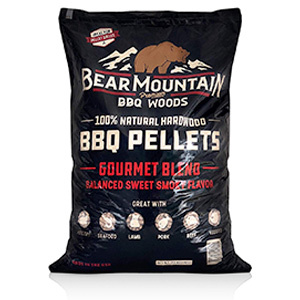 Bear Mountain BBQ wood pellets are expertly blended by dedicated craftsmen to create the perfect balance of savory, smoky flavor. These all-natural grilling pellets are made using the highest quality American hardwoods with no fillers, binders or oils. As one of the original BBQ pellet makers, Bear Mountain is committed to the environment and sustainable forestry - using only residual materials from certified lumber mills. Great for the planet and your next grilling experience!